“They say there are more people alive today than have died in the course of human history.” This is the quote the movie opens with. This was another way of saying “Dustin, I know you paid to get in here to see the movie, but why don’t you consume yourself with something else for the next 45 minutes instead.” Really? How the hell is that possible? When did human history start? What does that suggest about our future? Will that always be the case? Al Gore was right. We’re fucked. And who the hell is he quoting? He just said “They say…” They could very well be The Fraggles. And what the hell do they know about anything? They live in caves, for Godsake, caves! I was quickly sidetracked. The movie had little to do with the origin of human history or Fraggles. Or Al Gore. And I’m still not sure what was supposed to be loud and/or close and to what degree. The movie was about a son who loses his father and spends the movie searching for a matching lock to his father’s key. And it’s much different than Hugo, who was searching for a matching key for his lock. See, different movies. This borderline autistic child loses his father in 9/11. The movie definitely uses 9/11 to tickle your tear ducts, but it isn’t untastefully done. In fact, there weren’t many more shots of “the worst day” in the movie than was in the trailer. 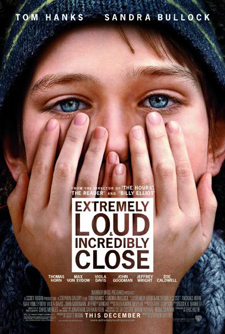 The movie focused on young Oskar’s mission to find a message that his father may or may not have left him before he died hidden somewhere in the city. This is a lot of emotional heavy lifting for a child actor not named Haley Joel Osment. I learned in memoir class that you can always write about the bad stuff you did when you were a kid because the audience sympathizes with you. You are not yet responsible for your actions. But at the turn of the film, Oskar told his mom that he wished she was the one who was in the World Trade Center instead. That’s tough to recover from at any age. He whispered “I love you” under the door for just about no reason other than to win the audience back. It did not work for this viewer.